Welcome to Denver Playgrounds & Parks. In this Kickstarter-supported project, I set out to compile a detailed review of the over 700 public metro Denver playgrounds. Between 2014 and 2017, I visited each park & play area (with my two kiddos in tow), took pictures and notes, and rated it on specific criteria. I hope my efforts will help other parents learn about the multitude of urban and suburban playgrounds in greater Denver. The complete results are available as a printed guide book and two smartphone apps. It’s time for a major update! A lot of new playgrounds were constructed in the past couple of years and I’m busy researching them all. The printed guidebook is now nearly out of print (under 100 copies left), so I’m focusing on the iPhone app. Expect an update in spring of 2019. I am busy working on over a dozen playgrounds that were renovated in 2016 and 2017 throughout the metro area, including some brand-new installations and replacements. Stay tuned for an update to both iPhone apps! The 3rd edition of the guide book has launched and the book is back in print! It contains over 160 additional playgrounds and a new focus on the top 50 playgrounds. Time to celebrate the “Expanded 2016 edition”. With the book out of print for several months now, I’m hard at work on a third, expanded edition of the printed guide book. I expect a launch date at the end of April. Thanks for everyone's enthusiastic interest in the project! I have nearly sold out of the book and I’m down to my last 10 copies. If you’re looking for a print copy, check with the many local Denver stores. Version 3.0 of the iPhone app includes over 120 new parks. The completed project features over 700 public playgrounds. You get these and many other updates in the app immediately. I’m working on adding about 100 playgrounds. These parks will bring the total to over 700 and complete the entire greater metro area, from E-470 up north to C-470 in the south. Expect an app update in a few months. The expanded version of the guide book has been printed! It features 55 additional playgrounds, higher print resolution, and 10 additional pages. Available on Amazon and at local Denver stores. I’m working on adding new playgrounds to the iPhone app, mostly in the Golden and west Littleton area. Done! The printed guide book has officially launched and is finally available on Amazon and in local Denver toy and book stores. 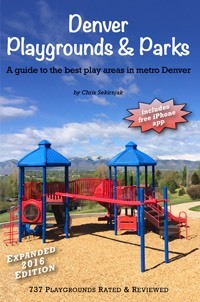 The new iPhone app “Best Playgrounds in Denver” is available on the App Store. It goes far beyond the scope of the book. I’m happy to announce the availability of my first app “Denver Playgrounds & Parks”. It features an overview of more than 500 public playgrounds, with map locations, photos, and ratings. It’s a Go! The Kickstarter project has successfully gained financial support. Thank you to all 44 backers... you rock! The Kickstarter project has officially launched. View my project video and pledge your support. Thank you.